We are gearing up and getting excited to get started in the greenhouse in the next week or two! 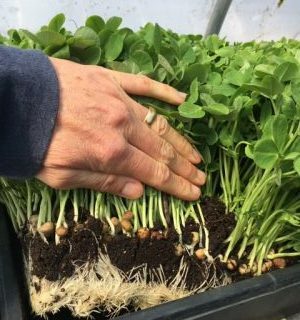 Microgreens will be one of the first batches of seeds to be sown and are typically one of the first greens we have available each spring. In case you aren’t familiar with them or haven’t taken the opportunity to try them, we’d like to explain what they are and why you may want to consider adding them to your diet. 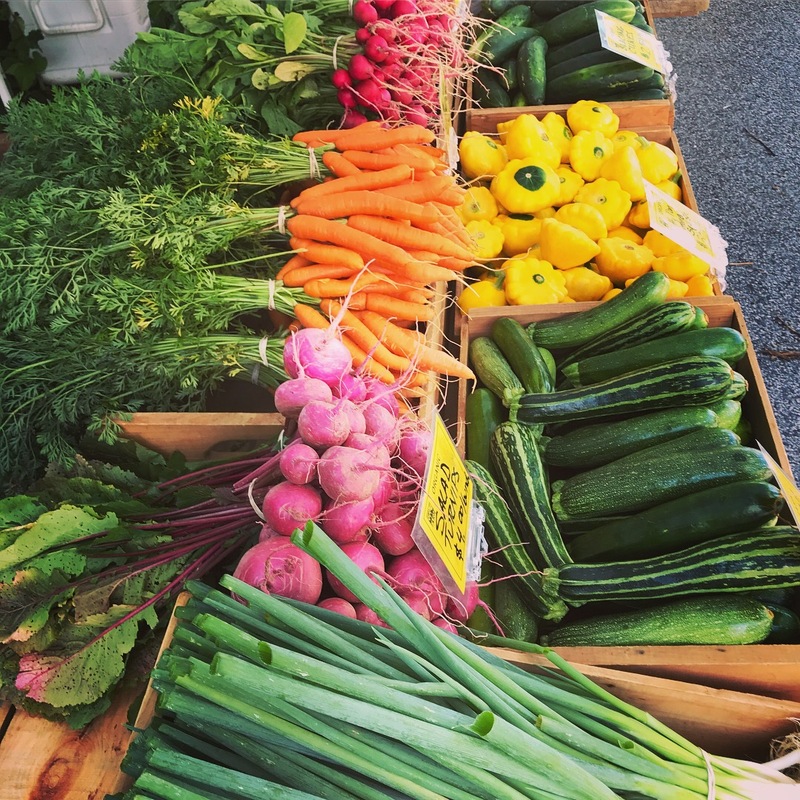 We will also describe how we grow them here at Stout Oak Farm because while they are becoming more popular at farmers’ markets, not all farms grow them using the same agricultural practices. Sprouts, microgreens and baby greens are all unique early stages in plant development. Each stage has certain identifying characteristics and varying nutritional values. Microgreens are the stage of growth between sprouts and baby greens. Think of micros as the second stage of seed development when they establish their roots and their first leaves called cotyledons. 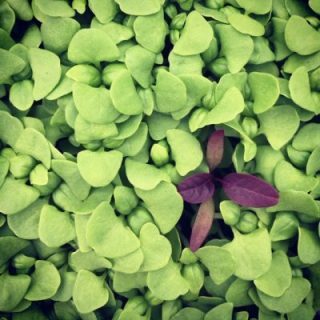 Microgreens may be harvested at this stage or just beyond this point when they begin to establish a set of true leaves which distinguish them from other varieties of plants. 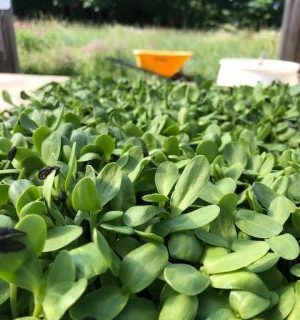 Microgreens are typically harvested at a size of 1-3 inches and include the stem and the leaves but not the root system. The average time from seeding to harvest is only 10-14 days. If allowed to continue to grow past this point they would potentially reach baby greens size. Chefs have been using micros in their kitchens since the 80’s as a way to creatively accentuate and add new flavor to their dishes. 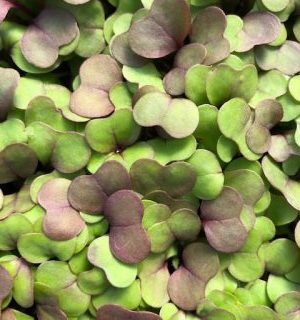 While microgreens have extraordinary taste as well as aesthetic appeal they have also been found to be extremely nutritious. Studies suggest they may contain much higher concentrations of nutrients as compared to more mature stages of vegetables and herbs. These tiny greens have power packed doses of vitamins, minerals and phytonutrients that can contribute to health promotion and disease prevention. Eat them alone as a salad or add them to just about anything at breakfast, lunch or dinner. All micros are especially tender and delicate and most are highly flavorful and aromatic. 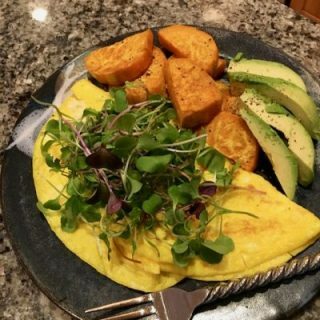 If you’re not eating microgreens you are missing out! Other than a few elements acquired from the atmosphere, plants draw all their nutrition from the soil and water that they are grown in. Here at Stout Oak we choose to use high quality potting mix from Vermont Compost Company to grow our microgreens. It is a compost based potting mix developed for organic growers. Ingredients are listed as follows: blended from composted manure and plant materials, sphagnum peat moss, crushed and screened granite and basalt, blood meal, kelp meal, steamed bonemeal, mined gypsum, vermiculite(a mica mineral expanded by fire), washed coconut coir, and herbs. We also choose to use high quality microgreen seed from Johnny’s Selected Seeds in Maine and High Mowing Organic Seed Company in Vermont. Microgreens are seeded each week and we are able to consistently offer them throughout the growing season. We grow them in the protected environment of our greenhouse where we can carefully monitor and provide ideal growing conditions while also allowing them access to fresh air and natural sunlight. Organic potting mix, organic seed, fresh air and sunshine are our standards. 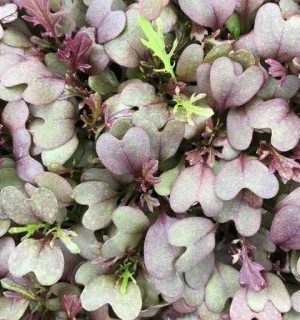 Stout Oak Farm microgreens will never be grown hydroponically or indoors under artificial lighting and we believe these things all contribute to why our microgreens are of exceptional quality. We harvest most of our microgreen varieties by hand with very sharp scissors just above the soil line. We cut our tender pea shoots and baby kale in speedier fashion with a pair of battery powered garden shears. See them in action on our instagram! We offer two signature varieties of microgreen mixes. Our “Springtime Mix” includes arugula, broccoli, cabbage, garnet red mustard, kale, mizuna and orach or amaranth. Our “Zippy Mix” is a spicier version of our Springtime Mix with the addition of daikon and red arrow radish. We also grow dwarf grey sugar pea shoots and micro cilantro that are available each week. Seasonal offerings include sunflower shoots, micro basil and unique mustard and kale blends. 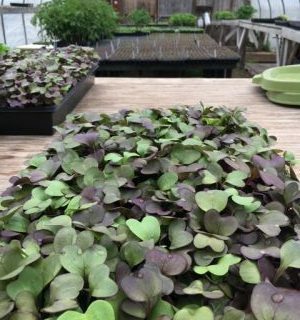 If you have already sampled our microgreen mixes we hope you have enjoyed them and for those of you that haven’t we encourage you to try some this spring! Know that we aim to provide you with the freshest, healthiest and most nutrient dense microgreens available! Grown with care, hand harvested, gently washed and packed and available at our farm store or at the weekly Exeter farmers’ market opening later this spring!